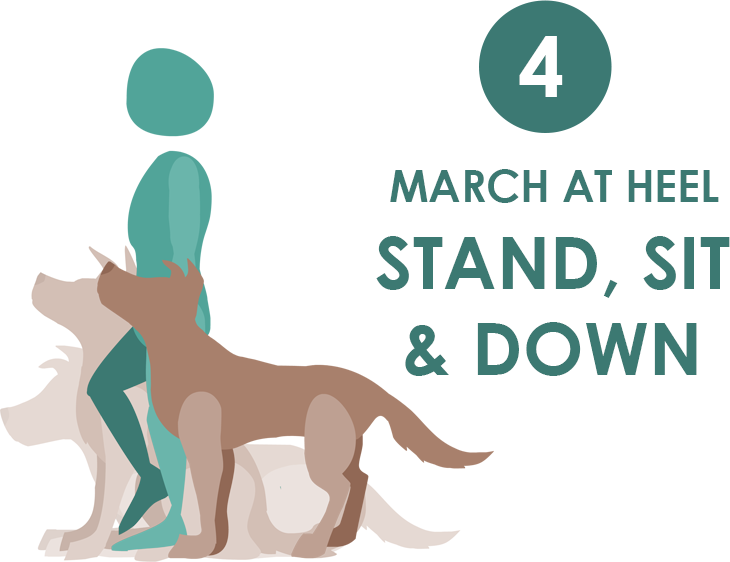 Stand, sit and down in heel position with handler marching in place. Handler starts by marching in place and then cues a stand, sit and down in any order. Purpose: Demonstrate appropriate response to various cues while handler is in motion. Exercise set-up: Handler sets up with the dog in heel position, either sitting, lying down or standing. The starting position does not count as a cued option. The handler starts to march in place. The exercise begins when the handler begins to march. The handler cues all three positions in any order with a verbal and/or hand signal while continuing to march in place. There must be a pause of at least 1 second between positions and after the final position. The exercise ends when the handler releases the dog from the final position. Non-qualifiers: Handler does not move feet while cueing positions. Dog does not respond to the position correctly. Dog requires multiple cues to take the correct position. Dog does not hold the position for a full second, or anticipates the next position. Dog significantly leaves heel position to perform positions (more than a 30-degree angle out of position or moves away from the handler). Dogs anticipates an un-cued position or offers an incorrect position. Video does not permit the exercise to be adequately judged. Tip: Remember you can use both a verbal and a hand signal for this exercise!